A 100% acrylic coating with sand designed for tennis, basketball and other sport and recreational pavement surfaces. 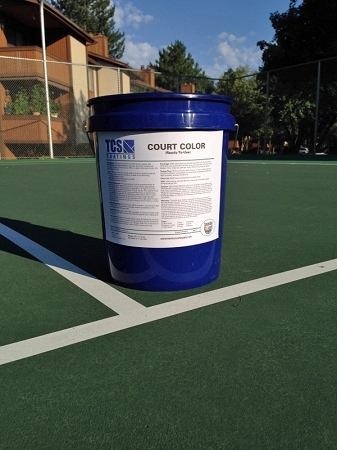 TCS Court Color (RTU) is ready to be used, simply mix thoroughly and apply. For orders of more than 2- 5gal. pails, please Contact Us for a freight rate! Please tell us the item and quantity you would like, the Zip Code it will be shipped to, whether or not if it is a residence or business, and we will get you a firm freight cost. Surface Preparation: Pavement surface must be cleaned entirely of dust, dirt and debris. Repair of pavement surface defects, depressions, and cracks should be complete prior to application. All repairs must be flush and smooth to adjoining surfaces for best results. New asphalt must cure 30 days and new concrete must cure 28 days prior to applications. It is recommended that any uncoated/bare surface receive one or more coats of TCS Court Resurfacer as required by surface roughness and porosity to provide a smooth, dense underlayment for application of color coatings. Concrete surfaces should have a medium broom finish or similar roughened texture. WATER. Simply mix materials to a smooth uniform consistency with a hand-held drill and mixing paddle. Application: Apply with a soft rubber squeegee. A minimum of two coats of TCS Court Color (RTU) are recommended for desired color, hiding, and durability. Important: Stir material thoroughly before using. Temperatures must be a minimum of 50 ºF and rising both during application and for a period of at least 24 hours after applications. Do not apply when rain is imminent in the forecast. Keep from freezing. Close container when not in use. Coverage: Yield calculations are figured per gallon of TCS Court Color (RTU) and vary according to surface texture and porosity within the limits below: .12 to .15 per sq. yard per coat or 60 to 75 sq. foot, per gallon. Drying Time: TCS Court Color (RTU) dries in 1-2 hours under optimum drying conditions. Low ambient or low surface temperature, shade, and high humidity increase drying time. Clean Up: Wash tools in water before material dries. VOC: This material contains less than 150 grams of volatile organic compounds per liter. Caution: KEEP FROM FREEZING. KEEP OUT OF REACH OF HILDREN. Do not take internally. If swallowed, call a physician immediately. In case of contact with eyes, flush immediately with water for 15 minutes and call a physician. Do not apply when rain is imminent. When not in use, keep container tightly closed and upright to prevent leakage. Do not store in direct sunlight or above 100 ºF. In case of spillage, absorb and dispose of in accordance with Federal, State and Local regulations. the substructure over which its products are installed. 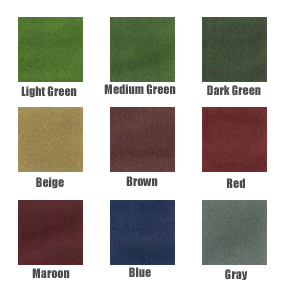 Colors Available: Dark Green, Medium Green, Light Green, Red, Beige, Grey, Maroon, Blue, Brown. Total Area 7,200 sq. ft. / 800 sq. yds. Playing Area 2,808 sq. ft. / 312 sq. yds. Outside Court Area 4,392 sq. ft. / 488 sq. yds.